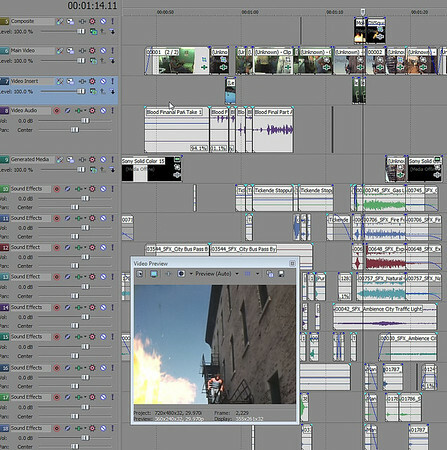 I can never emphasize enough how important sound editing is when creating the end product. The film transfer and editing is only part of the work. You need to add a sound track to the film. In today's world a silent film just isn't going to make it. Please don't even talk to me about music. You need to really work on that one before it is acceptable. Everyone expects sound and you need to add a lot of it or fix what is there. You add sound by layering it one over another. In the city you would have ambient noise of cars, people, road noises of cars passing over manhole covers, the beeps of trucks backing up, horns, sirens, etc. Then you would have sounds from the foreground of those things specifically in frame. Doing all of the above fools the viewer into thinking sound was captured during recording. The below video was a silent Super 8 film made in 1976. Would you have know if I didn't tell you?